During the last few weeks, I have been showcasing sample daily itineraries for a visit to Rome, Italy’s capital city. In Day 1 of the Rome itinerary, we explored the historical sites and took in some of the most famous ancient monuments. In Day 2 of the Rome itinerary, we headed over to Vatican City to experience the splendor that exists there. The following Rome daily itinerary will be the last in this series, and would be what I would consider my personal favorite. It has less to do with seeing, and is more to do with simply experiencing. For your third day in Rome, it’s time to slow down… just a little. This is the day for soaking up Rome. To take in it’s beauty, to appreciate it’s specialness, and to understand what it means to live la dolce vita. 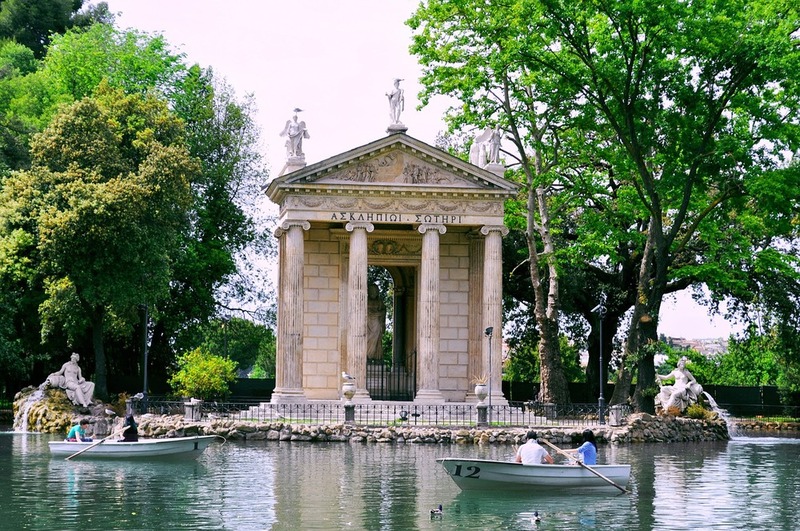 Begin the day with a visit to Villa Borghese, the largest public park in Rome. It is a pleasant reprise from the noise and heat of the city, and is home to a lake, temples, fountains, statues, and several museums. Consider renting a bike to leisurely get around the park. The must-see museum here is Borghese Gallery, which you must reserve beforehand for a 2 hour visit. You will be mesmerized by painting and ceiling frescoes, along with beautiful sculptures by Bernini, amongst others. Next, head down a long flight of stairs to Piazza del Popolo. Consider dining outside at Osteria St. Ana. This is the perfect place to grab lunch, have a drink, and do some first-class people watching. If shopping is your thing, you are now properly fueled to turn your attention to the several pedestrian-only shopping streets surrounding you. Continue your stroll by heading down via Babuino for a visit to one of the world’s most famous squares, Piazza di Spagna (Spanish Square), which sits at the base of the Spanish Steps. From the Trevi Fountain, continue on to Piazza Navona, via the Pantheon. If you followed my Day 1 Itinerary, you’ve already spent some time at the Pantheon, but it’s worth walking past again on your way towards what could be considered Rome’s most beautiful square, Piazza Navona. The large and lively square features three magnificent fountains. You've now concluded your stroll through what is considered the very heart of Rome. For dinner, why not make your own delicious meal, with some help from a professional. Taking a cooking class in Rome will allow you to return home with some skills to replicate (or at least try) some of the amazing dishes you had while on vacation. End your night with a perfectly made cocktail in a chic and trendy atmosphere at Hotel Russie’s Stravinskij Bar. They have a lovely hidden garden in the center of Rome and one of the cities most extraordinary cocktail lists. Now that you've read Day 3, make sure you read Day 1 and Day 2 to get an idea of how you can make the most out of your time and have a good starting point for creating a Rome itinerary for 3 days. In addition, check out my post on where to stay in Rome for a great boutique hotel option in the heart of the city. This concludes my overview of what I hope looks like an amazing Rome 3 day itinerary map for you to consider. Now, here is where the tough decision making comes. Do you stay longer to see and experience more of the eternal city? Do you head on to another part of Italy and continue your exploration of this beautiful country? Or do you set your sights on a different part of Europe and make this trip a multi-country exploration? Wherever your wanderlust is leading you, I hope you let Milk and Honey Travels help get you there! To download an easy to follow PDF snapshot of the whole 3 Day Rome Itinerary, click here. If you are interested in planning a vacation to Italy, it is one of my favorite destinations to create tailor-made itineraries for. Let's chat about what a perfect trip to Italy looks like for you.